Arizona Flags feature 13 rays of red and gold on the top half of the flag, representing the 13 original colonies of the Union, and the rays of the Western setting sun alike. The bottom half of the flag has the same Liberty blue as the United States flag while the copper star at the flag center shows that Arizona is the largest producer of copper in the nation. 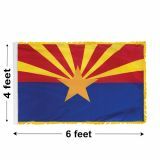 Our Arizona state flags are great options to show your state pride and celebrate your legacy. A subtle ensemble of functionality and form, our flags bring together excellent craftsmanship and premium quality materials. 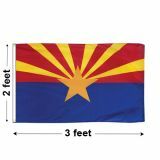 Choose from outdoor or indoor Arizona flags to match your needs. We also have indoor flag sets of heavy oak wood to enhance the milieu of spaces and to leave a stroke of state pride. Choose from 6 different sizes that range from a compact 3’x 5’ to a majestic 8’x12’. Shop from our complete line of Arizona State Flags right away and get the best prices, quick shipping, and much more! 100% customer satisfaction guaranteed! Our Arizona Flags are 100% made in the USA and are available in various materials choices and sizes to meet the weather conditions and location needs. Nylon flags are light weight, which makes it dry faster in a storm and fly elegantly even in light and medium wind conditions. The UV resistance and durability of the fabric will keep our outdoor flags beautiful for a very long time. If you are looking for a heavy duty outdoor flag, place your bets on these heavy 2 ply polyester flags which are well suited for heavy wind conditions. Our commercial grade flags are finished with heading and grommets and will make a perfect choice for daily use flags. Not just for state pride, you can even flaunt your sporty side with our Arizona Diamond backs baseball flags. Show your team spirit with our officially licensed car flags made from heavy-duty polyester. 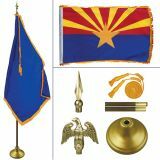 Browse our collection Arizona Flags and choose a model that matches your need. Need help? Call us at our toll free number (888) 287-3524 or email us at customercare@tuffflags.com.